letter to teacher for not attending parents meeting. Excuse letter for not attending parent teacher meeting. Application for not attending parents teacher meeting in school. 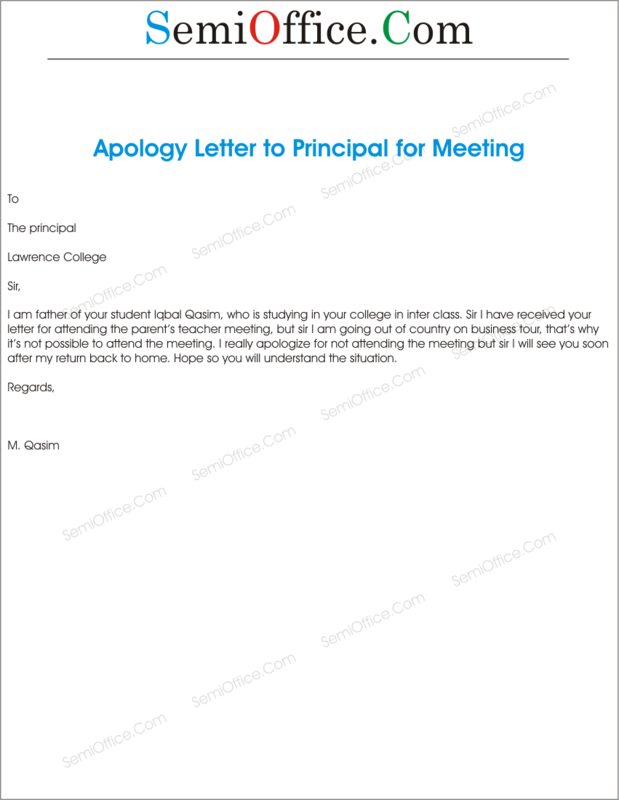 Excuse letter for being absent in school meeting. 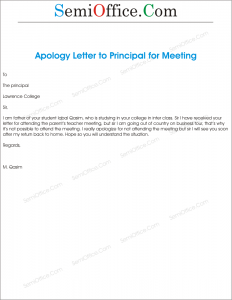 Apology letter to school principal from parent. With due respect, I wish to apologize for not being able to attend Guardian meeting. I work in a company which requires me to travel a lot. It was a co-incidence that I was posted in another city during the time of Guardian meeting. Therefore, I could not attend it. Please, accept my apology as I understand how much it means to everyone. I will visit you as soon as I get back from work to catch up with details. Thank you very much for understanding my situation. I highly apologize for not participating in the guardian meeting of this year. Due to the Annual General Meeting of the company in which I am employed I could not attend the guardian meeting of my son. The AGM took place at the same date and timing on which the guardian meeting was scheduled. I know that this absence is cannot be satisfied, but I have had detailed discussion with all the teachers after the school. I am very sorry for my absence in the meeting and assure to be present in the next meeting. I am father of your student Iqbal Qasim, who is studying in your college in inter class. Sir I have received your letter for attending the parent’s teacher meeting, but sir I am going out of country on business tour, that’s why it’s not possible to attend the meeting. I really apologize for not attending the meeting but sir I will see you soon after my return back to home. Hope so you will understand the situation. With all due respect it is stated that my aunt had died last week in Gujranwala and we had to go there on urgent basis to attend her funeral service, I am extremely sorry for not attending the school guardian meeting, pardon me for this. I make sure that I will bring my guardian in the next meeting to discuss my progress report. I understand it is very important for parents and teachers as well. Thanks.